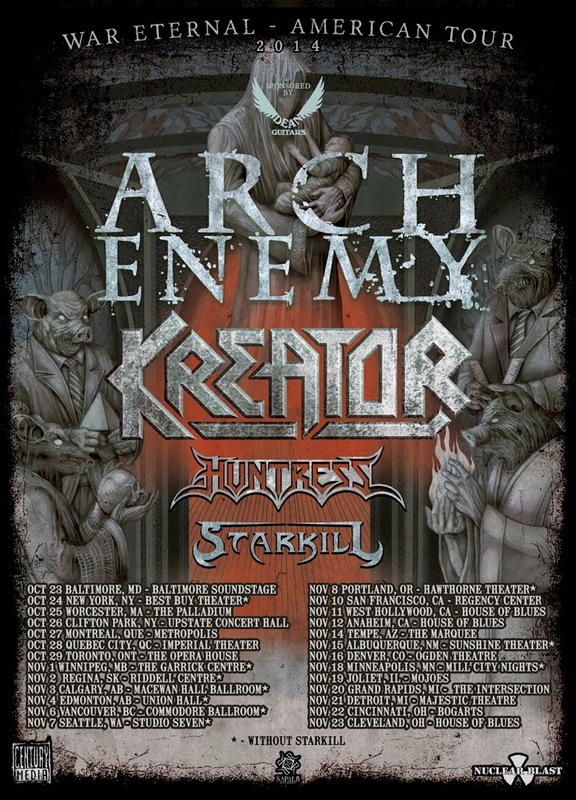 ARCH ENEMY announces North American headlining tour with KREATOR, HUNTRESS, STARKILL as support! Earlier this week, metal icons ARCH ENEMY unleashed their new album, War Eternal, across the world, with critics hailing it as their "strongest album in years" (Decibel Magazine). To kick-off the War Eternal campaign, the band launched an extensive European tour, which is currently underway through the rest of the year. In addition to these dates, ARCH ENEMY will also make their much-anticipated return to North American soil this October/November! Featuring KREATOR, HUNTRESS, and STARKILL as support, this headlining trek will be the band's first tour in the States since 2011-- and the first US tour to feature new members Alissa White-Gluz (vocals) and Nick Cordle (guitar)! ARCH ENEMY's Michael Amott (guitar) comments: "It's been three long years since ARCH ENEMY last played North America, but now the wait is over! We're riding a veritable metal tsunami in Europe with our new album 'War Eternal' and look forward to spreading the chaos on this N.A. run! ARCH ENEMY is very proud and excited to be teaming up with Teutonic thrash titans KREATOR as well as HUNTRESS and STARKILL! Miss this show at your own peril!" KREATOR's Mille Petrozza (vocals, guitar) adds: "Both bands have been talking about touring together for many years, now it becomes reality: KREATOR and ARCH ENEMY on one bill in the USA and Canada! We are looking forward to another killer run in support of our album 'Phantom Antichrist' before we will start writing new stuff in 2015! With ARCH ENEMY's new album 'War Eternal' being a monster, this will be THE metal tour of the fall. Don`t miss it!"